When Ben Gardier, CFO of National Laser Institute, a Scottsdale, Ariz.-based company offering medical aesthetics training, thinks of 2014’s challenges, he says one new tax has been hurting his business: the medical-device tax. That’s because the tax, which went into effect in January, is not only applied to pacemakers and defibrillators, it’s also added to obscure items such as wrinkle-cream applicators. A component of the Affordable Care Act, the medical-device tax calls for a 2.3% excise tax on devices that are listed with the Food and Drug Administration and used in the direct treatment, diagnosis or monitoring of a patient. One consequence of the tax is that it also affects products not traditionally thought of as medical devices due to the way they are classified. Botox, for example, is delivered to suppliers in a vial, so the muscle relaxer is exempt from the tax. But tissue filler Juvederm is prepackaged with a syringe, so it is considered a medical device. Just operating in some states as opposed to others can add to those problems. Arizona, for one, has a separate tax, called a privilege tax, on these products, which has caused Gardier’s firm to move some distribution operations to Texas, which does not have the tax. National Laser Institute’s vendor decided that it would no longer absorb the tax for the firm, though it had done so previously. As with a lot of other newly installed or pending legislation, larger firms may be able to swallow such taxes more easily. Smaller firms, for example, that sell products over the Internet are also expecting to get walloped if the Marketplace Fairness Act, which is pending review by the House Judiciary Committee, gets passed. The law calls for retailers with annual online revenues over $1 million to collect state tax on remote sales. The legislation could be daunting for companies that only do business online. Compliance is a big reason for those pessimistic comments. “Whether you have nexus [commonly referred to as physical presence in a state] or not, or inventory there or not, all that stuff goes completely out the window. Now you are burdened essentially with 45 states and [Washington,] D.C. [the areas with sales tax],” says Faggiano. David Seiden, a partner at Citrin Cooperman, an accounting advisory to middle-market companies, says states are so competitive for business that they try “to push the envelope of nexus as far as possible.” They will continue to do so until Congress passes a law like the Marketplace Fairness Act or the Supreme Court defines what nexus is, says Seiden. As it stands now, nexus, according to Supreme Court definitions, is too vague, and hybrid versions of the term that states use in practice, such as “economic nexus,” leave the door open for interpretation by states. 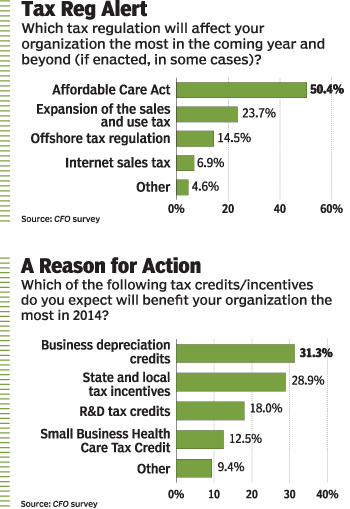 The tax, Seiden says, could take away a state’s ability to differentiate itself from others. The nuances that exist in state tax laws, after all, can be the deciding factor for a business to operate in one jurisdiction or another. The same can be said for state tax incentives, which are equally important bargaining chips to win over business. The September CFO survey of finance executives showed that 28% of respondents, the second-highest tally behind business depreciation credits at 31%, said state and local tax incentives were the most important tax credit or incentive that will benefit their firm in 2014. Daniel Effron, tax partner and national leader of the state and local tax practice group at Marcum, a New York–based accounting and consulting firm, sees this first-hand. CFOs and corporate executives, he says, are not only seeking out new incentives, they are using them more to plan their businesses. “We’ve done engagements where clients have actually relocated their businesses just to take advantage of certain state or local tax incentives,” says Effron. States are realizing the lure incentives carry. California, for example, will grant a 50% reduction on sales taxes for qualifying manufacturing equipment beginning in July 2014 until 2022. New Jersey, meanwhile, launched its Angel Investor Credit in January, which provides for a tax credit of up to 10% of an angel investors’ qualified investment in New Jersey emerging-technology companies.